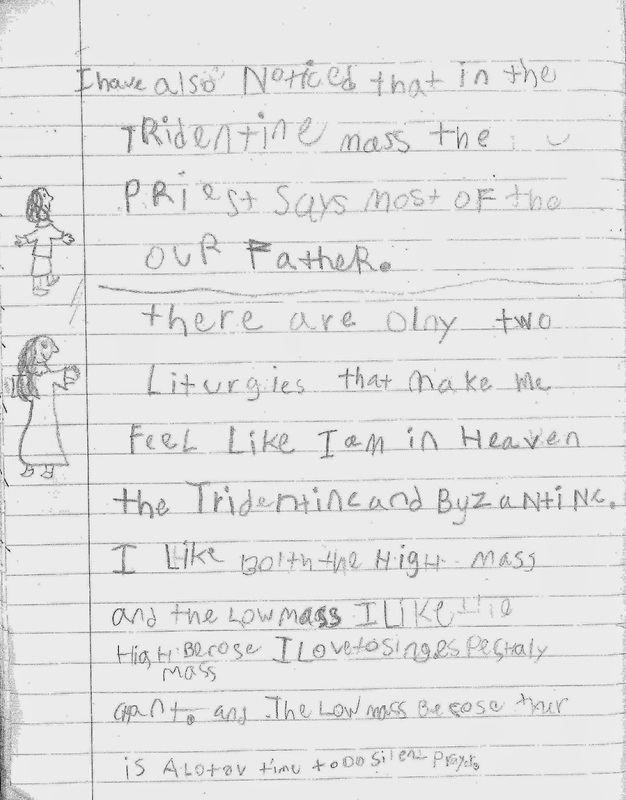 A subject that deserves much more attention than it has received (at least, so far as I know) is how children relate to the traditional Latin Mass. One thing seems very clear to me from my experience with my own children and those of my friends who attend this Mass regularly, namely, that, contrary to all the predictions of the liturgists about the need for children to have simplified liturgies that hand-feed them bits of Gospel food, children are often not only content to attend the TLM but can become quite captivated and entranced by it. 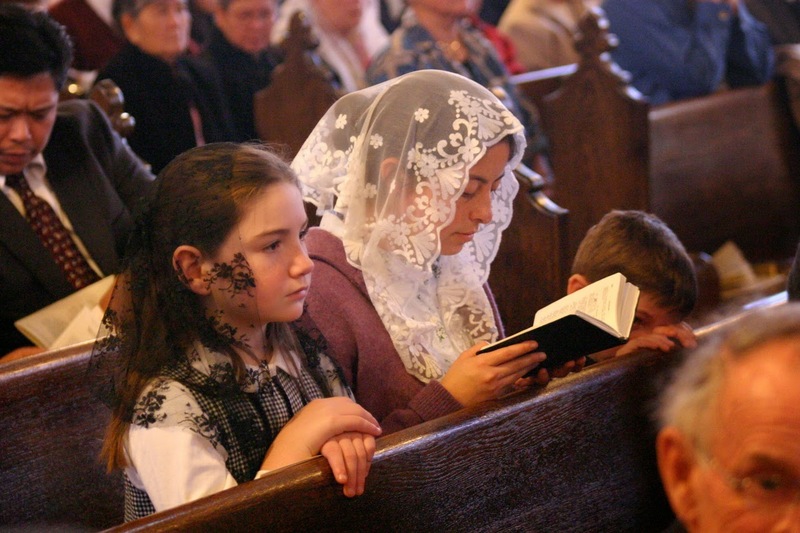 We all know of boys who are squirmy urchins until, donning cassock and surplice, they enter the serried ranks of altar servers and behave like soldiers, or young ladies who, with a veil on their heads, give themselves over to prayer in a way that is truly edifying even for their parents. 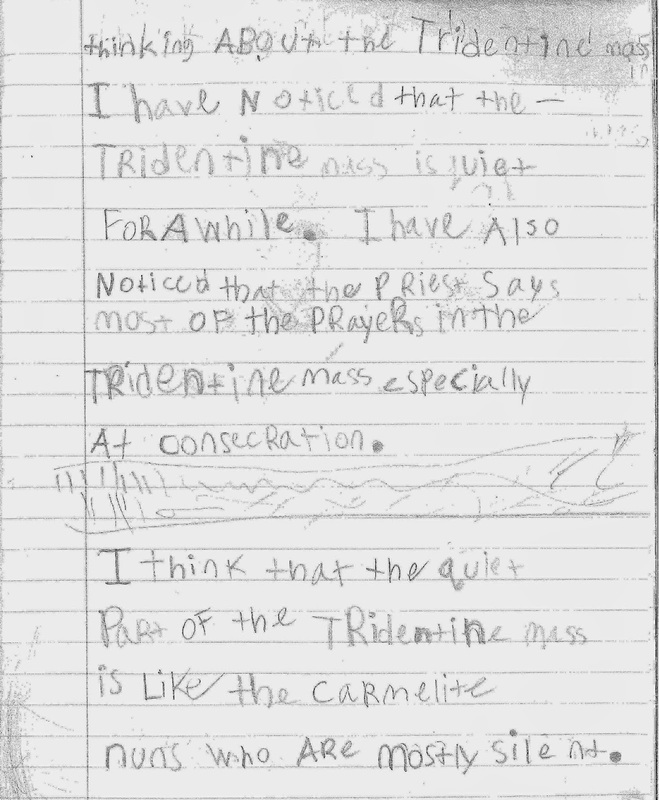 As a homeschool writing exercise, my daughter was asked by her mother to write down her thoughts on the Mass we attend on Sundays. (This was a few years ago, when our daughter was 9.) Below are the handwritten pages, followed by a transcription. I have noticed that the Tridentine Mass is quiet for a while. I have also noticed that the priest says most of the prayers in the Tridentine Mass especially at consecration. I think that the quiet part of the Tridentine Mass is like the Carmelite nuns who are mostly silent. I have also noticed that in the Tridentine Mass the priest says most of the Our Father. There are only two liturgies that make me feel like I am in heaven, the Tridentine and Byzantine. I like both the High Mass and the Low Mass. I like the High Mass because I love to sing, especially chant. And the Low Mass because there is a lot of time to do silent prayers. Also the priest says Amen for you at communion. in all of your holy sacraments. 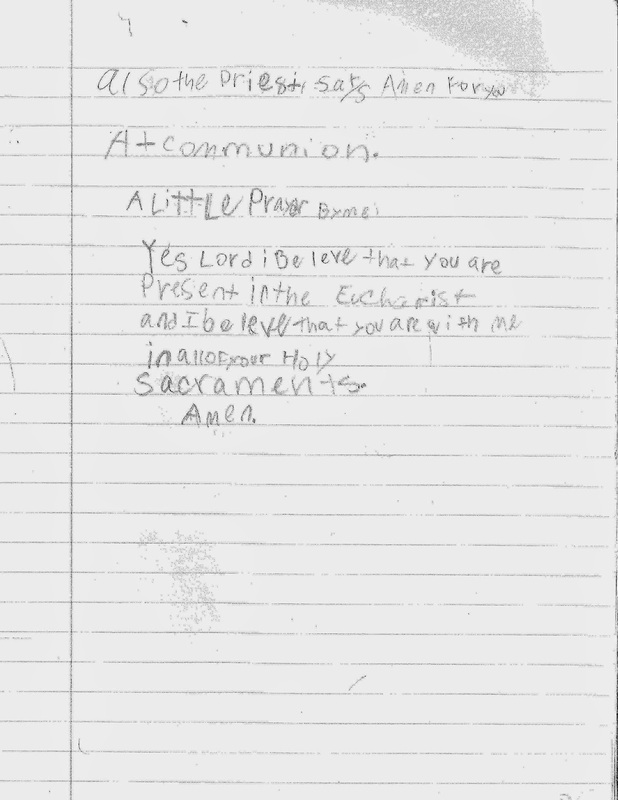 How beautiful are these simple, unaffected sentiments, straight from the heart of a child encountering the mystery of the Lord! “Out of the mouths of infants you have perfected praise to foil the enemy and the rebel” (Ps 8:2). Would that more children could be exposed to the singing and the silence that help the soul to feel and to know that the Lord is truly present among us! 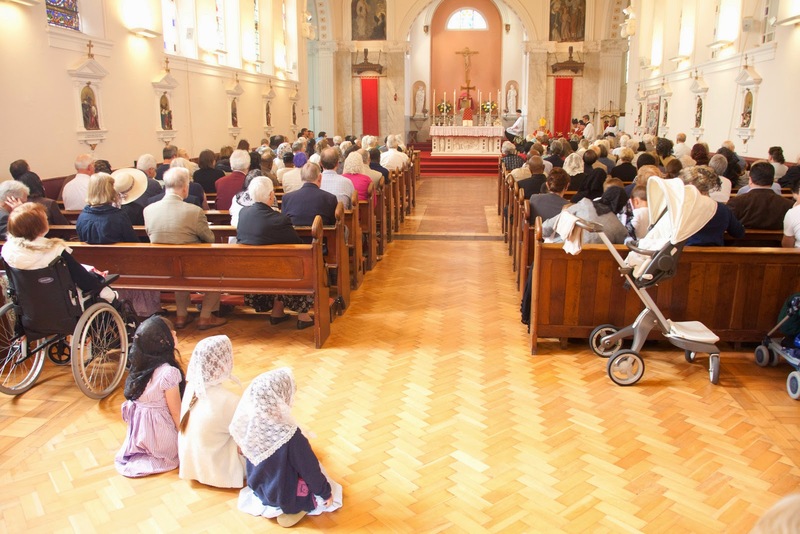 Now, I’ll be the first to admit that there are plenty of challenges with bringing children to the TLM, especially babies and toddlers who cannot yet “follow” the liturgy and who often make a tremendous amount of noise and trouble for their parents. Even in this case, though, we should not underestimate the subtle formation of the psyche that is taking place due to exposure to prayer-saturated silence, liturgical symbols, the pageantry of the Mass. After all, if children begin to be formed in their souls even from the moment of conception by the music and voices they hear coming to them from outside the womb, how much moreso after birth will their surroundings influence the development of their memory, imagination, intellect, and will? Let us not underestimate our children’s need for exposure to the sacred liturgy in all its demanding and rewarding fullness, nor underestimate their ability over time to absorb this fullness and make it part of who they are! Over at OnePeterFive can be found a pair of articles on “Helping Children Enter into the Traditional Latin Mass” (Part 1, Part 2), which discuss how parents can assist in this process of gradual immersion in the Mass of the Ages and how they can “buy time” for the littlest ones. Here, I would like to elaborate on a particular point adumbrated in those articles. Kids need to practice sitting still at home before they can do it well in Church. We parents often make the mistake of trying to correct bad Mass behavior at Mass, where it is ineffective and awkward. A month or so of a family rosary can teach most kids how to sit still, because at home one can be insistent about the expected behavior in a way one can’t readily do at Mass. It is a chance to practice sitting still and, for older children, kneeling, so that their little bodies become familiar with a certain discipline of formal prayer, which feeds right into the Mass. Those with large families know that you can see the difference between children who have been given such opportunities and those who have not. Connecting with this art of sitting still is the deeper question of instilling in children a love for peace and quiet as well as a habit of keeping themselves occupied (i.e., not having to be entertained, but being able to entertain themselves). To put it bluntly, if our homes are inundated with the noise of television, stereo, audio books, or other aural stimuli, the quietude of soul essential for participation in the TLM will not be nurtured. We need ample spaces of simply “natural noise” and even “quiet time” in the household. One thing that works well for some families is having a quiet hour in the early- or mid-afternoon, to acclimatize children to the need (and, dare one say, the possibility) of a general down time where each has to keep him- or herself occupied quietly. The importance of such things can hardly be overestimated: how else are young Catholics going to learn how to listen to the “still, small voice” (1 Kgs 19:12) of the Lord, how will the soil be plowed for the meditation and contemplation characteristic of mature prayer? What we are looking at is nothing short of a training in the awareness of self and other that defines human interiority and relationality, and separates us from the beasts of the field. As Maria Montessori noticed and documented so well, small children have an innate ability to concentrate. Alas, modern parenting practices thwart this ability due to the mistaken idea that children must be “entertained” and endlessly distracted by all sorts of artificial stimuli. The created world is mysterious and wonderful in itself, and, if given the opportunity, even very young children can concentrate on something as simple as their own toes for much longer than adults think possible. The wife of a friend of mine took a video of their then-eight-month-old playing with blocks for over twenty minutes. The key to this happening, however, is preventing others from disturbing the child who is concentrating. Our daughter is partially responsible for us being at an FSSP parish now. She was involved in a girls’ program there and attended Mass every Saturday. She started to veil. Then she told me about how the Extraordinary Form impacted her, and her misgivings about the Novus Ordo. (I had not at that time talked to the children about my study of the N.O. Our conversations dealt only with liturgical abuses.) She developed a devotion to the Little Flower, and just become much more reverent. It was impressive. (She’s a normal girl. She competes in Irish Step and takes horseback riding lessons and jumps on the tramp with her brothers.) But it was partially the wisdom of a child that brought us to the Extraordinary Form. I am so fascinated by how otherwise seemingly faithful Catholics are so obtuse or just blind when it comes to the Mass. They must be much better people than I to be sustained by a guitar Mass. I really need all the Church can give me - all the smells and bells - to be able to make it through the week. The devil has so many avenues of communication today to get his message across. I think it’s time the Church pulled out the big guns . . .
Our daughter noticed the differences as early as age 10. She said she fell in love with the EF. She also said once she veiled, she became more effective at prayer. She felt like she could concentrate more - no distractions. In addition, she felt like she could image Mary more because Mary is always depicted with her head covered. I often tell our sons that our daughter is going to get us into Heaven. Our boys also noticed the difference in the reverence of the priests. Our oldest is 14 and now serves the Mass. He talks about the precision in the priests’ movements, and how they do not allow their eyes to lift above the altar rail when they turn towards the congregation. Also, he has been impressed with how the priests prepare for Mass, and how they attend to prayers of thanksgiving immediately afterward. No meet and great after Mass. There was a good article in the most recent edition of Adoremus in which a priest described his experience in Chicago at a Catholic school where they were taught Gregorian Chant from the 1st grade. I really think such formation is possible for young children. I also think that the EF is not above them, although I do think parents need to be more engaged in explaining the meaning behind all the rituals. It does come alive for them. Our 11 y.o. son loves to follow along in the Campion Missal. In addition, I try to go over the readings and the propers the night before at the dinner table. So, I do think the EF demands more of us, but those demands are worth it. Parents, be not afraid to embrace these demands, and be not discouraged by the challenges and setbacks! Your efforts will be rewarded. Priests who celebrate the traditional Latin Mass, thank you for making this profound education and sanctification available to us and our children! Priests who are not yet offering the TLM or not doing so publicly, please consider what a powerhouse of grace and truth this venerable form of the Roman Rite offers to the entire People of God—beginning with the littlest. 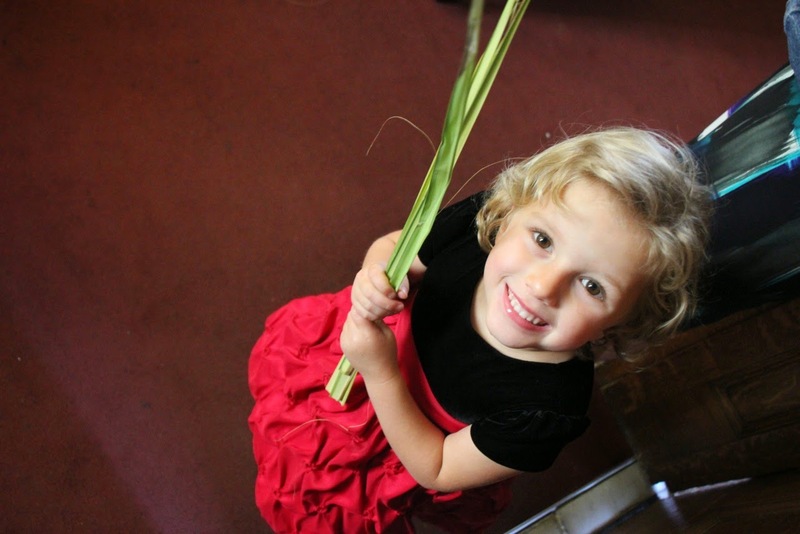 “Let the children come to me, and do not hinder them; for to such belongs the kingdom of God” (Luke 18:16). Photos by Joseph Shaw and Ron Lawson, used with permission.